I am a firm believer that in order to be your best at either sport, indoor or beach volleyball, you must play both. I have heard through the years, many coaches not allowing kids to play beach volleyball during indoor season. Aside from this now being completely illegal by USAV rules, your potential will be limited in how good you can be in both sports. Here is just one way that I have come to this conclusion. Stick with me here, as I am no mathematician. 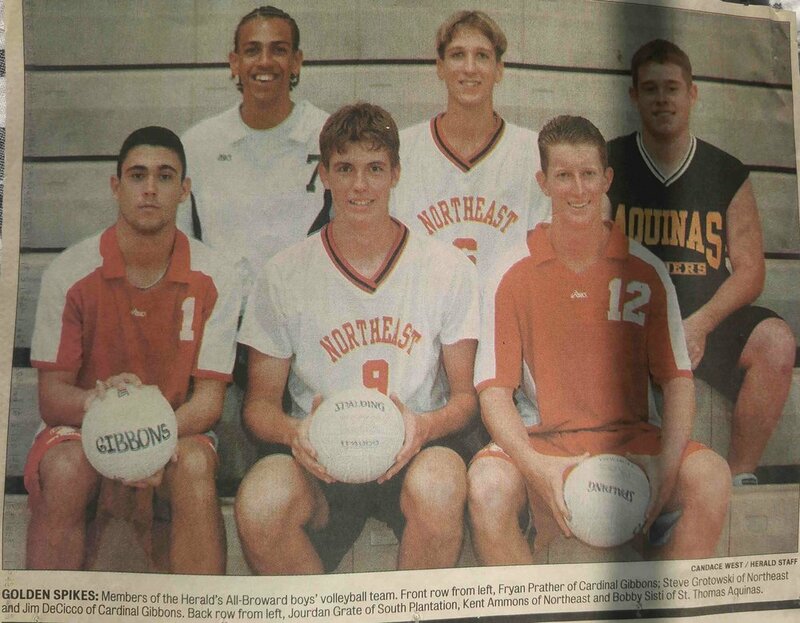 The 6 boys shown in the picture below make up the 1999-2000 Boys Volleyball First Team All-Broward County. Out of the 6 boys, 3 played beach volleyball. In 2000, there were approximately 26 boys volleyball teams in Broward County. As an estimate, lets assume each team had 10 participants. This would equal a total of 260 boys volleyball players. Out of the 260, only about 10 played beach volleyball competitively. Given these numbers, we can conclude that only 2.6% of the total participants played beach volleyball, but made up 50% of the all county team. That being said, we find there was only a 1.2% chance for boys that did not play sand volleyball to make the all county team as opposed to a 30% chance for boys that did play beach volleyball. That is an awfully big coincidence if you choose not believe the numbers. We can also come up with the number that beach volleyball players have a 25x's (30%/1.2%) higher success rate to make an all-county team. Keep in mind these numbers will fluctuate as more kids play beach volleyball, because it will raise the level of all competition on the court and sand. If you look close, you may even recognize some of these players. Steve Grotowski received a scholarship to New Haven, Connecticut for indoor volleyball and went on to represent Great Britain in the 2012 Olympics for beach volleyball. Jim Decicco played beach volleyball all through his indoor high school career and received an indoor volleyball scholarship to Lindenwood. If you care to read more on me, just click this link. Don't limit your potential! Get on the sand, you won't regret it!